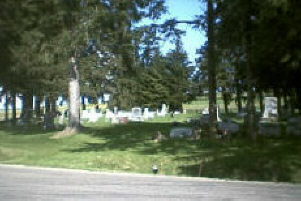 Cemetery is on 244 at the Andrews Settlement crossroads. ANDERSON, Stella. Spouse of Anthony J. Born 7-20-1874, died 10-27-1889 - (1900 Allegany Census) Death date is wrong. She was living in 1900. BISHOP, John C. Sr. Spouse of Abigail Benjamin. Born 9-22-1812*, died 9-2-1882. Age: 65y 6m 19d - Born in VT. (1880 Allegany Census) - Civil War Vet, Co K, 15th PA Cav, Pvt. BISHOP, Rockwell O. Spouse of Louise E. White. Born 4-10-1895, died 7-23-1974 - Son of George L. and Mary (Kibbe) Bishop. Wed 4-21-1917 at Ulysses. BLOW, Frank E. Spouse of Gertrude S. Born 1-1-1912, died 12-14 2000. Age: 88 - Son of Henry W. and Ella (Mansfield) Blow. Wed 12-29-1934 in Coudersport, 3 sons. BLOW, Gertrude R (Scoville). Spouse of Frank E. Born 12-30-1914, died 3-7-2010. Age: 95 - Dau of Ray and Ethel (Burch) Scoville, born in Port Allegany. Wed 12-29-1934 in Coudersport, 3 sons. BURCH, Ruby N. (Fosmer). Spouse of Ernest. Born 1893, died 1969 - Three children. CAVANAUGH, Frank. Spouse of Orpha Morley. Born 2-23-1858*, died 12-10-1879. Age: 21y 9m 23d - Wed 1-19-1879. CAVANAUGH, Orpha (Morley). Spouse of Frank. Born 1862*, died 12-1879. Age: 17 - [Gone from our home but not from our hearts] Wed 1-19-1879. COLLER, Eunice M (Maye). Spouse of Augustus B. Born 9-14-1882, died 1-12-1935 - Dau of Addison C. and Genette (Ryan) Maye. CURRIER, Larry G. Spouse of Kathleen S. Perry. Born 5-4-1946, died 5-23-2011. Age: 65 - Son of Bert A. and Agnes (Matteson) Currier. Born in Wellsville NY. Wed 2-15-1974 in Cuba NY, 3 children. CURRIER, William H Jr. Spouse of Jeane M. Born 9-5-1936, died 7-15-2002 - Son of William H. and Mary E. (Gilliland) Currier, Sr.
DAUB, Lois Ann (Palmatier). Spouse of Harold Raymond Jr. Born 6-40-1940, died uncut - Dau of Noel D. and Martha J. (Currier) Palmatier. DOWNS, Asa. Spouse of Hannah C Pye. Born 9-23-1816, died 12-6-1891 - Born at Dedham MA. Wed 3-15-1840 at Truxton NY, 6 children. (1850 Allegany Census) - Civil War Vet, Co K, 149th PA Vols, Pvt. ESTES, Elijah B. Spouse of ?. Born 1841, died 6-12-1915. Age: 73 - Survived by wife and 2 children. - Civil War Vet, Co H, 71st NY Inf. Pvt. Transferred to Co F, 120th NY Inf, Sgt. FRENCH, Ann E. Spouse of John F. Born 1838, died 1902 - [His Wife] 1900 Allegany census gives birth date as 3-1847. HASKELL, Dawn B. Born 7-2-1935, died 6-10-2006. Age: 70 - Dau of Charles W. and Mary E. (Lewis) Haskell. Born in Wellsville NY, worked 30 yrs at Galeton Production. HAYNES,. Born ? ?, died ?? HILE, Rachel E. (Burch). Spouse of Harlan G. Born 12-14-1915, died 12-19-2011. Age: 96 - Dau of Ernest and Ruby (Fosmer) Burch, born at Ford Hill. Three children. JAMES, Alzada. Spouse of Henry C. Born ? ?, died abt. 1911 - 4 children. JAMES, Henry C. Spouse of Alzada. Born 1844, died 7-29-1912 - Son of George and Betsey James. 4 children. (1860 Allegany Census) - Civil War Vet, Co. K, 149 PA Vols, Pvt. Wounded at Wilderness, Va. on May 5, 1864 - mustered out with company on June 24, 1865. LENT, Minnie E. Spouse of F J. Born 1881, died ?? LYDIC, Helen F. (Oldham). Spouse of #1 Norman Barchet, #2 David B. Lydic. Born 4-8-1930, died 4-18-2016. Age: 86 - Dau of Ellis Paul and Hazel Terry Oldham, born in Elmira NY, died in Coudersport PA. Three children surnamed Barchet. LYDIC, Nora E (Thompson). Spouse of Max B. Born 7-24-1922, died 2-23-2013. Age: 90 - Dau of Frank and Nora (Black) Thompson. Born in Curwensville PA,12 siblings, a homemaker. Wed 3-29-1947 in Curwensville, 2 sons. MATTESON, Nettie. Spouse of William. Born 1842, died 9-21-1910 - [His Wife] Wed 9-25-1865. MILLER, Sperry Merville. Spouse of Susan J. Vanderhoof. Born 1882, died 11-5-1908 - Killed in a train wreck. Survived by parents, wife and children. NELSON, Anna A. (Downs). Spouse of Charles W. Born 10-6-1849, died 10-23-1887. Age: 38y 17d - Wed 6-22-1872 at Clara PA.
NELSON, Charles Wilbur. Spouse of Anna Downs/ Electa Greenman. Born 11-13-1847, died 8-1-1917 - Son of Samuel and Betsy (Cole) Nelson. Wed Anna 6-22-1872 at Clara PA.
NELSON, Ralph. Spouse of Mary. Born 1847, died 1920 - Son of Lyman and Anner (Hall) Nelson. PALMATIER, Betty (Dunbar). Spouse of C. Mike. Born 1936, died bf 7-2008 - Dau of Merle and Ruth (Whitaker) Dunbar. PALMATIER, C. Mike. Spouse of Betty Dunbar. Born 1934, died 1964 - Son of Noel D. and Martha J. (Currier) Palmatier. PALMATIER, Ella (James). Spouse of Aranris A. Born 1871, died 1914 - Dau of Henry and Alzada James. PALMATIER, Francis A. Spouse of Ella James. Born 2-1868, died 4-10-1954 - 1900 Allegany Census gives birth year as 1869. PALMATIER, Frederick W. Born 1960, died 1960 - [A Bud of Love] Grandson of Noel D. and Martha J. (Currier) Palmatier. PLANTS, Reuben C. Spouse of Arminda ?/ Maria. Born 9-1839, died aft 1890 - Son of James and ? Plants. Born in NY, a farmer. Wed to Arminda in 1860 census, to Maria in 1900. (1860, 1880, 1900 Allegany Census) - Civil War Vet, Co G, 46th PA Vols, Pvt. 1861-1864. Discharged on September 18, 1864 at expiration of term. PORTER, Stella (James). Spouse of R. L. Born 1871, died 1958 - Dau of Henry and Alzada James. RYAN, James I. Spouse of Ann Lathrop. Born 7-01-1836*, died 11-1-1891. Age: 55y 4m - Son of Martin and Betty (Drake) Ryan. (1850 Allegany Census) - Civil War Vet, Co H, 46th PA Vols, Pvt. Mustered out on September 13, 1864 at expiration of term. SCOVILLE, Almon C. Spouse of Lucy A. Hurlbut. Born 5-14-1823, died 4-1-1899 - Son of Jesse and Rhoda (Humphrey) Scoville. Born in PA, a farmer. (1880 Allegany Census) - Civil War Vet, Co H, 46th PA Vols, Pvt. Discharged on June 8, 1865 by General Order. SCOVILLE, Fred W. Born 4-14-1866, died 8-15-1880 - Son of Almon and Lucy (Hurlbut) Scoville. SWEIER, John. Born ? ?, died aft 1890 - Civil War Vet, Co. G 13th PA Cav, Pvt. UNKNOWN, Donna. Born ? ?, died ?? UNKNOWN, Leeona. Born ? ?, died ?? UNKNOWN, Lena. Born ? ?, died ?? WILSON, Charity. Born 8-23-1831, died ?? WRIGHT, Venus Jean (Scoville). Spouse of Donald H. Born 1-22-1933, died 11-28-2004. Age: 71 - [Together Forever] Dau of Merle C. and Martha (Perry) Scoville. Born in Andrews Settlement, a factory worker. Wed 9-17-1949 in Andrews Settlement, 3 sons.